Herman Miller Envelop Desk Unit - Authorized Retailer and Warranty Service Center - Envelop Desk Unit by Herman Miller, Aeron, Mirra, Embody, Celle, Eames Home Office Ergonomic chair. 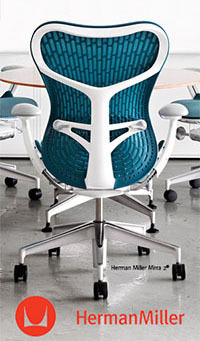 The EMBODY CHAIR and AERON CHAIR are great complementary products for this Desk. New Everywhere Standard Range Electic Adjustable Height Model now available. Product Story - All those hours at work, you move, your chair moves, the desk stays put. Even the best task chairs can't do it all, so we've brought ergonomic principles to the one element that was just sitting there. A desk that moves? Radical! A desk that promotes healthful movement? That makes sitting at a computer comfortable? It's Envelop, the first desk designed to help you, your chair, your desk, and computer work together for better health and comfort. Design Story - The late Bill Stumpf and his design partner, Jeff Weber, have been responsible for many of the imaginative leaps that have produced our most innovative solutions. Embody began with Bill's and Jeff's awareness of an unsolved problem: the lack of physical harmony between us and our computers. They thought of the small universe that encapsulates the office worker�the "envelope"�as consisting of three parts: chair, surface, surround. While working on their radical idea that a chair could do more than just minimize the negative effects of sitting and could actually have positive effects on the seated body, they became acutely aware of the problem of the static surface. As they worked to develop the Embody chair, they began to rethink the whole concept of a desk. Why did it have to just sit there? Why did computer users have to manually move their laptops, keyboards, pointing devices, and monitors around, trying to maintain the right position and angle? Why couldn't a desk do that? Envelop became Jeff's project, and he was responsible for most of the work that produced the final product. It represents both a great leap forward in ergonomic design and a logical continuation of Bill's and Jeff's ideas about the body in work postures that had been guiding them for years. Stop Crouching - Heavy computer use is hard on the body. Sitting in an ergonomic task chair is a big help, but even then, you hunch, you crouch, you lean in toward that glowing screen. Leading to back and neck pain, eyestrain, and fatigue. Because the Envelop desk moves and encourages movement, it lets you take full advantage of an ergonomic task chair and natural body movement. Envelop allows you, your chair, your desk, and technology to work in concert with one another. Envelop creates a breakthrough level of personal comfort and overall health, thanks to optimal positioning of your computer and a more healthful posture for you. It lets you achieve your most comfortable posture while keeping your eyes on the task. Your Eyes Will Always Win - When you're seated at your computer, your body will position itself�and maintain that position, even when it leads to discomfort�so that your eyes focus most easily on the monitor. The result is often postures that aren't healthy or comfortable. Envelop's unique seven-degree tilt keeps technology in the correct ergonomic position, letting you maintain the visual display at the optimal distance (18 to 30 inches) and angle (10 to 25 degrees downward). s you shift position, your laptop or keyboard, pointing devices, and monitor are positioned synchronously nearer or farther away�without shifting them separately. So your eyes are always focused as they should be while you maintain a healthful, comfortable posture. Moving Support - It's called Envelop because the sliding, flexible support surface�the "infield"�envelops you as you work. The infield slides forward seven inches and pivots down seven degrees to provide continuous flexible support for your forearms and wrists. Your forearms rest comfortably on the soft, resilient infield, reducing pressure on them and eliminating awkward wrist positions. Designed to be used with an ergonomic chair that features a synchronous tilt, Envelop provides ergonomic support through a wide range of seated postures�whatever is most comfortable for you.